The Northern Indiana Tourism Development Commission website, its design, all text, graphics, and content are the property of Northern Indiana and its affiliates. 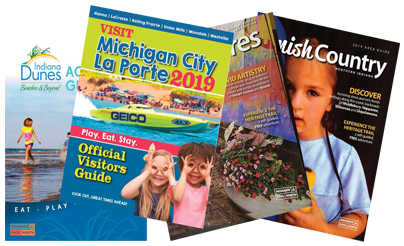 None of the content found on this site may be reproduced, republished, distributed, displayed, sold or modified without the express written permission of the Northern Indiana Tourism Development Commission. Links to other websites are provided for your reference and convenience only. We assume no responsibility for the accuracy, appropriateness or views expressed on other linked websites. NITDC is not acting as publisher of any materials contained on other linked sites and do not seek to control the content of or maintain any type of editorial control over any linked sites. Links to other sites should not be construed to imply that this site is in any way affiliated or associated with, or is legally authorized to use any trade mark, trade name, logo or copyrighted symbol found in the link or link descriptions to other sites.